In a few days, it will be 2013 and a week closer to something I have been looking forward to for a while: the 221st Meeting of the American Astronomical Society. From January 6 through 10, the meeting will take place in Long Beach, California. A few months ago, Dr. Wright told me that he was going to send me and Eunkyu, my fellow student researcher, to the meeting, and I was thrilled. Attending meetings and presenting your work is one of the best parts of undergraduate research! We made sure to register and submit our abstracts early. Eunkyu and I have branched off in our duties in research, so we will be presenting separate posters. This past week, I have been working on my poster. Once I fleshed out the content and scattered my figures around, it was just a small struggle against the distribution of white space. Over the summer, I took a required technical communication class; making this particular poster has put some of the design elements from that class to use. 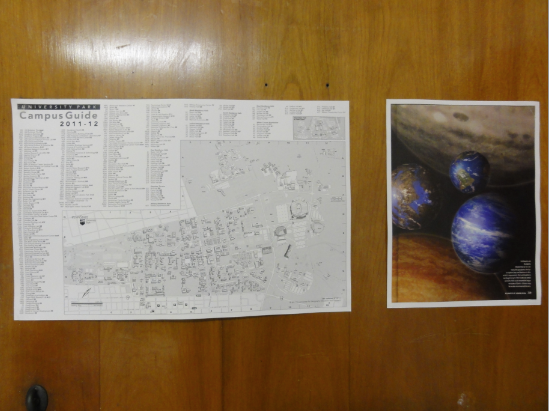 The poster is not yet complete, but I can't wait to hold the physical copy. I can't wait to stand next to it during my poster session on Wednesday, January 9. I can't wait to read the other posters, to meet people and learn of their research. I can't wait to attend the reception for undergrads. I can't wait to sit in on plenary sessions and lectures. I can't wait. In two of my classes, I have been hearing about and researching missions relevant to exoplanets. 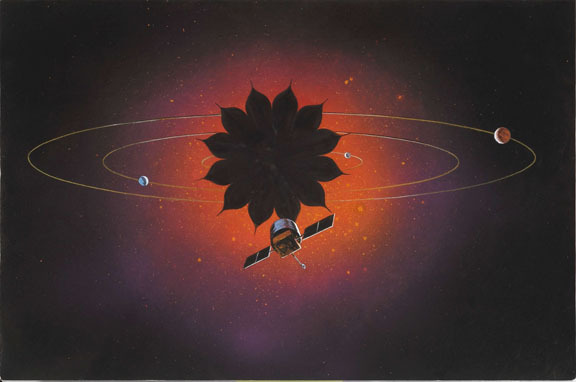 There is New Worlds Observer, a proposed NASA mission that will send a starshade thousands of kilometers in front of a space telescope, blocking out much of a host star's light so that we can image the planets. There is Gaia, an ESA mission to be launched in 2013 that will map the positions of a thousand million stars over five years, which will identify any stars that are changing motion due to the gravitaional pull of planets. There is FINESSE, another proposed NASA mission that will study a few hundred exoplanets and their atmospheres using transits. There is a lot to look forward to. 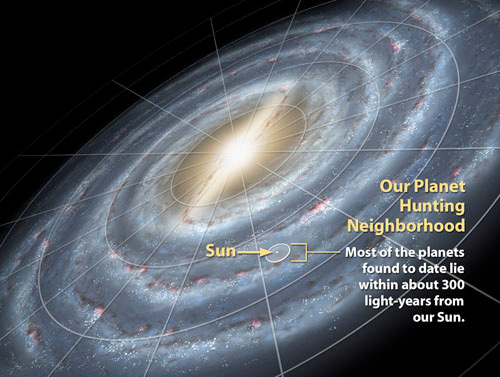 But whenever I see that first image, which shows how large our search area is for most exoplanets compared to our Galaxy, I simply tend to lean back in my seat, and think, once again: There is a lot to look forward to. I didn't think this semester would be so different. My course load seemed reasonable, and I even added yoga to balance out my five main classes. But I seemed to have lost a grasp on time management. I've felt basic college stress before, although not like this. This semester, I've often been on the brink of tears. I haven't exactly neglected research, but I haven't been giving as much time for it. I can't quite decide which class to work on first, so the work becomes scrambled, and I somehow have made it to the last few weeks. I've stopped blogging. It seems straightforward to compare stressful situations to a steep climb. Instead of thinking about a figurative hill, I remembered one I have personally hiked up. In my junior year of high school, I trekked in Tiger Leaping Gorge, located near Lijiang, Yunnan, in the south of China. One of the tougher parts of the route was termed "28 bends". It was a winding uphill struggle, making the heart put in effort to pump and the lungs reap for thin air at a high altitude I was not used to. There was no way I could have gone through all 28 bends without stopping. It's fine to sit down on a boulder and rest. This hill is not infinite; we will all eventually pick ourselves up and keep going. At the start of the semester, I put up the two following items on my door. I was afraid I would lose sight of the message I had in mind back, and indeed I had for awhile. Now, the reason I placed them there has come back to me: Remind yourself everyday where you're going, and why you're going there. In my Planets and Planetary System Formation class, we have been discussing methods of exoplanet detection. My professor brought up a paper written by Otto Struve. It was published in The Observatory in October 1952 - 50 years ago from this month. I am unfamiliar with this man's work, but he had proposed "A Project of High-Precision Stellar Radial Velocity Work." As my professor scrolled through the PDF, he summarized Struve's points. Struve argued that we can detect planets larger than Jupiter around other stars with the Doppler effect, a basic principle used in today's radial velocity technique. He argued that there is no reason why these planets cannot be a lot closer to their host stars than Jupiter is to the Sun, that their periods can be 1 day. Plenty of Jupiter-mass planets have been found so far, orbiting so close to their stars that their orbits are only a few days long, making their surface temperatures high and giving them the name "hot Jupiters." Then, Struve writes, "There would, of course, also be eclipses." Those, of course, would be transits. I was actually on the edge of my seat, thoroughly impressed. History was never a strong subject of mine, but more and more, I'm appreciating scientific history. Because of my astrobiology class, as we began our unit on the ancient Earth and brought back scenes from my previous geoscience courses, I'm also more confident that I like history investigated by science. 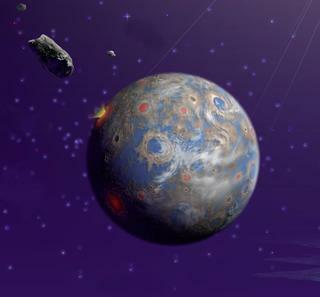 We discussed the proposed impact on Earth that formed the moon 4.51 billion years ago. At that instant, a series of questions raced through my mind that must have come up in the minds of those who found the answers that I saw on the powerpoint presentation. How did the moon form? Why is there an atmosphere? And when the picture of early Earth appeared, I realized that - obviously - the Earth didn't have the familiar green continents. Plants must have had an origin; when was this and how did plants rise? It was a thrilling chain of questions, the answers to which I once found ordinary. So many things we know about today began with a question. Some chose to use science to seek an explanation. A conclusion seems to be that there was a vast, rich history of the universe that we played no part in. History lessons given by science seem to reinforce the fact that our existence is rather insignificant. But I prefer to think of it as humbling. The opportunity that we have to learn about this history is so precious, wouldn't you agree? At some point during the semester, I would be walking around campus and find myself surrounded by people dressed in suits or formal clothing. I would realize that it was career fair week. Many of my peers have traded in their T-shirt and jeans for a suit and tie, flip-flops for business heels. This year, the Eberly College of Science provided a Fall Career Days Science Employer Reception for science students. Continue reading Career Fair Reception. The Department of Astronomy and Astrophysics hosts a series of presentations funded by the Ronald M. and Susan J. Friedman Outreach Fund in Astronomy. Free to the public, they are the Friedman lectures. Information on all lectures is available here. This year, Heidi Hammel, Executive Vice President of AURA, Inc. (The Association of Universities for Research in Astronomy), presented the "James Webb Space Telescope: NASA's Next Great Observatory." Also known as JWST, the telescope featured below will accept the torch of observational astronomy from the Hubble Space Telescope. Before the lecture, a group of us had the chance to dine with Dr. Hammel for the monthly women in astronomy meeting. Thursday, September 13, 2012, left me with both an introduction to an amazing upcoming instrument that will further advance astronomy as well as insight to sharing and communicating science. Continue reading The 2012 Friedman Lecture. The first image is a self-portrait taken with the camera on its arm, featured in the second picture. When I first saw these pictures, I thought, "It's so weird." The self-portrait is very similar to what some of us would do while we're visiting different places - it's typical tourist behavior. 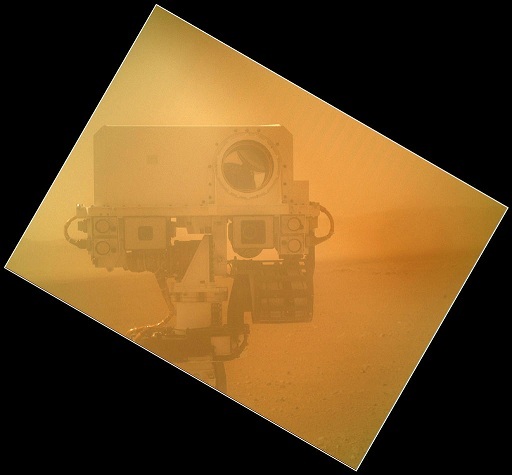 Suddenly, Curiosity's presence on Mars seemed concrete to me, and I felt another wave of awe. 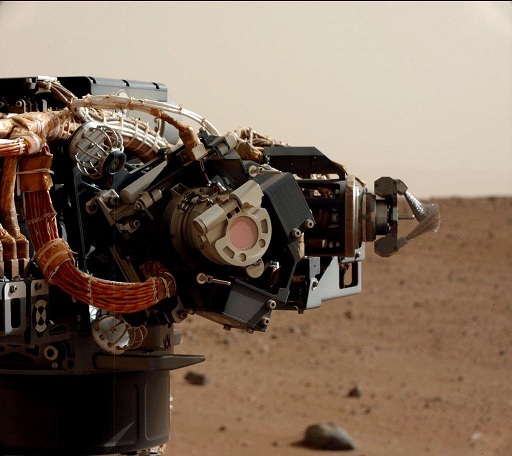 As I go to classes and work through my daily routines, Curiosity is busy exploring another planet. Speaking of social media, exoplanets.org has been getting more involved starting this summer. Ultimately, we are a website, and we want people to get the most out of it. Follow our twitter (@ExoplanetsOrg) to get updates on when we add planets or make changes to the database. You should also "like" us on facebook, although that is still under development. Updating facebook and tweeting? I get to do that for research from time to time. I guess you can't predict what you will end up doing in research, but that's what makes it exciting. Welcome to the first post of the semester! Posts will now be on Wednesdays instead of Mondays. It seems like, despite the semester has just started, we already need to think about our activities for next summer. Internship? Study abroad? A job? Based on my experience, this post will make some recommendations for the combination of summer classes and summer research. As for the seemingly unrelated title - well, some events happened this summer that I just couldn't neglect to mention. At the end of the spring semester, my academic adviser told me about Alien AstronoMysteries, a Penn State science summer camp to be held in the last week of June. Brendan Mullan, the camp director, is a graduate student in our astronomy department. In April, he won the National FameLab Astrobiology Competition, which is designed to find the best science communicator among young scientists in the United States. Alien AstronoMysteries investigates various topics from astrobiology. Extremophiles, habitable zones, exoplanets - yup, count me in. The National University of Singapore (NUS) organized an event for the Venus transit, hosting activties that began on the evening of June 5 until the end of the transit on June 6. Because I live closeby, getting to NUS was convenient. On the 5th, my parents and I first went to see a small exhibition that showcased the photography of a local amateur astronomer. Later that night, NUS held the Venus Transit Symphony, composed by Dr. Robert Casteels, at what I would describe as a big city version of the HUB lawn at Penn State's University Park campus. Continue reading 2012 Venus Transit.